The Optoma HD27e is a solid value at $599 street. An upgraded version of the Optoma HD27, it offers similar specs, but a slightly higher rated brightness, a lower fan noise rating, and a lamp life that's shorter in Bright power mode and longer in Eco mode. Compared with its competition in our eight-projector shootout, the HD27e is tied for best color accuracy and is one of the three best for contrast. It is not the brightest, but still plenty bright. In its best video configuration is bright enough to light up a 145" 1.3 gain screen in a dark room. It can go up to 90" in a room with moderate ambient light. And you can go bigger if you opt for the brighter video configurations that are not as precisely color balanced. 3,500-hour lamp life in Bright power mode; 12,000 hours with Dynamic Black On. Low Lamp Mode. Eco mode is 65% as bright as Bright mode. Video Optimized Lumens. For film and video, adjusting settings in Cinema mode offers a close color match to our reference projector. The 806 ANSI lumens is enough with a 1.0 gain screen for a 130" diagonal 16:9 image in a dark room or an 80" image with moderate ambient light. With a 1.3 gain screen, the sizes jump to 145" in a dark room and 90" with ambient light. Contrast and three-dimensionality is only a small step below the best in this sub-$700 group. Video Performance. Even straight out of the box, Cinema and Reference offer realistic color along with good contrast and sense of depth. For higher ambient light levels or bigger screen sizes, Game mode delivers natural-looking color as well. Contrast and depth aren't as good in Game mode as in Cinema mode, but the picture quality is good enough for casual use in a family room or for a backyard movie night. If you need still higher brightness, you'll have to put up with a green bias in Bright mode as well as significant loss of subtle shading that's most noticeable on facial closeups. The effect, called posterization, results in a more two-dimensional look for some images with gradually changing color, as in skin tones. Turning off Brilliant Color largely eliminates the posterization, but also lowers brightness to only a little higher than the level for Cinema. Much the same is true for Vivid mode, although the posterization and green bias isn't as extreme, and turning of Brilliant Color drops the brightness to below the level for Cinema. Basically, your best bets for picture quality are the Cinema and Game modes. Zoom Lens Effect on Brightness. The 1.1x zoom lens is too short to have any impact on lumen output. Brightness Uniformity. The HD27e's brightness uniformity is 53%, which is typical in this group of sub-$700 projectors, in which six of the seven DLP projectors measure 60% or less. Today's more expensive digital home theater projectors typically have higher uniformity. However, the very expensive 3-gun CRT home theater projectors from the 1990's typically had about 50% uniformity, so a uniformity score in this range does not necessarily produce a problematic picture unless there are obvious hotspots or localized dimming. On the HD27e we do not see such flaws. Input Lag. Depending on the Brilliant Color setting, the HD27e's input lag is only 33 to 34 ms with default settings. Turn Enhanced Gaming On, and it drops to 16.4 to 17.1 ms. The highest levels for Brilliant Color give the fastest lags. On-board audio. The 10-watt mono speaker delivers surprisingly high quality sound for such a small projector along with high enough volume to fill a small-to-mid-size room. Fan noise. Compared with other sub-$700 1080p projectors, the HD27e's fan noise is in the middle of the pack. In Bright mode, the audible noise can be noticed during quiet interludes in a film. In Eco mode it is low enough so few would notice it in a room with ambient noise, but you might become aware of it in a quiet traditional home theater. With High Altitude mode, it is loud enough in both Bright and Eco modes to be potentially intrusive in quiet moments, even in a room with ambient noise. Throw distance. For a 120" 16:9 diagonal image, the throw distance for the 1.1x zoom ranges from about 12.8 to 14.1 feet. The Optoma HD27e Projection Calculator will let you find the throw distance range for the image size you want. Lens offset. The HD27e's lens offset is most appropriate for installing inverted in a ceiling mount. It can also work well with the projector on a low table between the seats. However, keep your ideal viewing distance in mind when planning your set up. If the projector is at 13 feet from the 120" screen and placed between the seats, this means you would be sitting at a distance of 1.5x the screen width. That is ideal for some and a bit too far away for others -- it depends on where you like to sit in a movie theater. If you like to sit closer, say at a distance of about 1.2x to 1.3x the screen width, you may want to opt for a ceiling mount behind the seating area. With the projector positioned on a table the entire image is above the centerline of the lens, with the bottom edge of the image about 18% of the image height above the centerline. This is a greater upward offset than any of the HD27e's competition. Placing it on a rear bookshelf that's high enough to project over the heads of the audience will usually require you to tilt it downward to hit the screen. You can use keystone adjustments to square up the resulting trapezoid, but keystone is best avoided whenever possible since the compression will eliminate the ability to match a 1920x1080 video signal one-to-one with the diplay's pixel matrix. This tends to add artifacts to fine patterns in the image. At $599 street, the Optoma HD27e touches all the right bases for entry-level home use. Even with default settings, its Cinema mode offers nicely saturated, well-balanced color for film and video, and colors are close enough to accurate that without comparing it to a reference image most people won't see any need for adjustment. 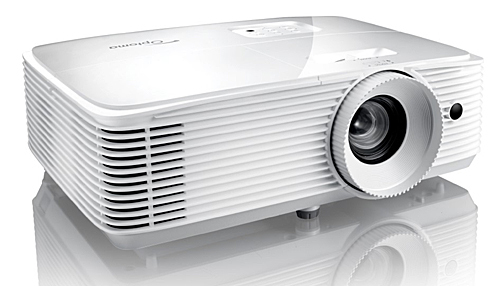 The HD27e's color is also easy to adjust, and color accuracy ties with the ViewSonic PJD7828HDL for closest match in this sub-$700 group to a reference projector. It also scores well on contrast and image sharpness. On both our horizontal and vertical test screens with alternating one-pixel wide light and dark lines, it held the full resolution, edge-to-edge, in sharp focus across the entire image. For gaming, the HD27e offers a rapid 16.4 ms input lag, which is the best it gets in projectors. For 3D, it supports both DLP-Link and VESA RF glasses, and it will let you customize 3D mode settings. We saw no crosstalk, a no more than typical drop in brightness compared to 2D, and no other 3D-related issues. The problems we enountered were minor, including the remote being finicky about being aimed just so, and synching taking longer than most projectors when changing inputs. On occasion when playing a DVD it would drop a frame so movement would stop suddenly, then start again. This didn't happen very often, and we saw it only when playing DVDs. The problem didn't show up with Blu-ray discs or when connected to a FiOS box. We saw barely a hint of rainbow artifacts and even those hints showed only in a contrasty black and white clip. All told, the Optoma HD27e is well worth considering, especially if you're into 3D as it is one of our top picks for 3D performance in the shootout. Due to its impressive color balance out of the box as well as its contrast it is competitive in the group as a dedicated home theater projector. It will also serve well as a TV substitute in moderate ambient light although it is not the brightest in the group for this use. Rapid input lag and high quality onboard audio make it great for gaming as well.